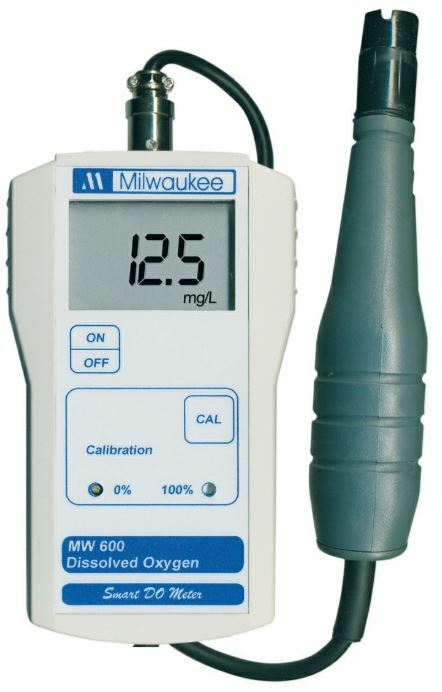 Running a dissolved oxygen test can be easy. And that’s good given how critically necessary these tests are for any variety of circumstances. Water quality issues can lead to corrosion, biological disasters within an ecosystem, water treatment mismanagement, and much worse. In short, a dissolved oxygen sensor is there to help measure water quality relative to the proportion of dissolved oxygen in the sample. When you’re dealing with real world applications, you may need to be able to sample and monitor levels of dissolved oxygen on the go. Outside of laboratory settings, consumer grade dissolved oxygen sensors break down to essentially three types: optical dissolved sensors, polarographic sensors, and galvanic sensors. And like you’d expect, each type of instrument offers its own unique set of strengths and weaknesses. They’re usually characteristics which emerge from the working principles behind how the different types operate, but these distinctions are also sometimes composed of decisions in design. You can begin your considerations by asking yourself some basic questions about the instrument. How portable is it, and how portable do you need it to be? Is it easy to navigate its interface and access the full feature set, or do you have to bust open the manual every time you want to take a reading? When it comes to any portable instrument, you’ll want to think carefully about the physical build of the device itself. Does it have some kind of waterproof protection that would make it suitable for field testing, or is it something that will shatter from a single fall? Understanding what it is you’re investing in can be the difference between accurate testing and expensive mistakes. Galvanic and polarographic sensors work through monitoring electrochemical signals. As dissolved oxygen is passed over the sensor, that oxygen undergoes a chemical reaction. The resulting reaction then produces chemical signals which are picked up by a dissolved oxygen sensor. That sounds simple enough, but as with so many things in life, the devil’s in the details. For example, polarographic sensors require a constant stream of voltage to polarize the instrument. That’s why they need 5-15 minutes of warm-up every time you want to use it. But galvanic sensors are self-polarizing, so they can be used right after you’ve finished calibrating them. Galvanic sensors also respond about 2-5 times faster than an optical sensor. But hydrogen sulfide can interfere with a galvanic sensor by permeating its membrane. Which brings us to optical sensors, which are capable of handling waste water environments which contain hydrogen sulfide. Optical dissolved oxygen sensors operate on the basis of a luminescent dye. Dissolved oxygen interferes with the dye from being expectedly luminescent when you strike a sample with blue light. After emitting blue light, the instrument uses a photodiode to compare the luminescence of a sample to the calibration. That’s a lot of information. For a quick recap, optical sensors are good for their rapid warmup time. They’ve got excellent stability once calibrated, so maintenance only needs to be done every year or so. But they use more power and respond slower than the other types of sensors you can choose from. Galvanic sensors don’t have a warmup time, and they respond quickly during testing. They’re also highly cost effective. But you’ll need maintenance every 2-6 weeks, and have to avoid hydrogen sulfide during your testing. That puts some constraints on the kind of testing these sensors can do, and it certainly rules out most forms of waste water management. Polarographic sensors have a great response time and are cost effective. But you’ve got to deal with warm-up time for the sensor, the same higher maintenance needs of galvanic sensors, and the same hydrogen sulfide sensitivity problems. 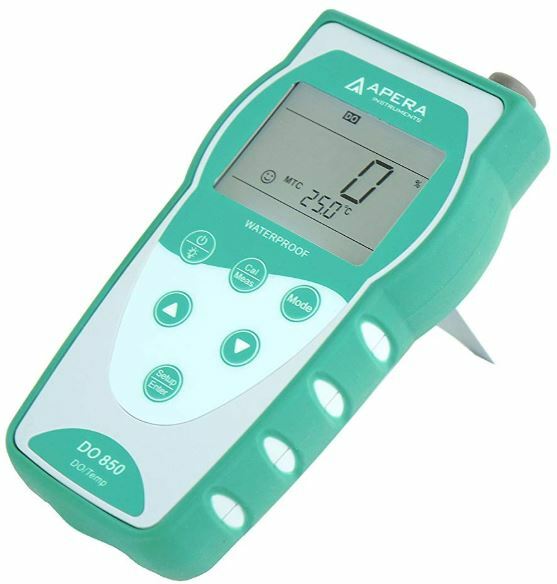 Apera Instruments is one of the world’s leading manufacturers of measuring instruments. And true to their reputation, the AI480 is a state of the art optical dissolved oxygen sensor. 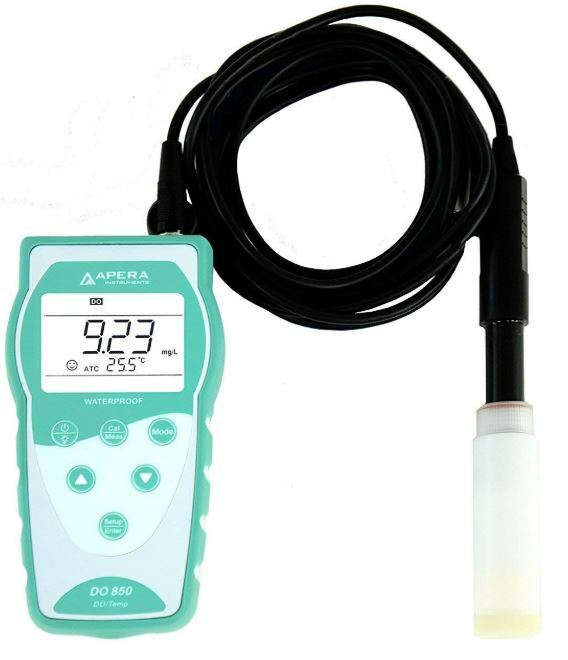 It’s for the kind of effortless and reliable dissolved oxygen (DO) testing you need for dirty wastewater management. The AI480 is equipped to handle hydrogen sulfide. And the set-and-forget calibration ensures you don’t need an expert using the kit to take accurate readings. The AI480 sits at 3.4 x 6.3 x 1.5-inches, weighing about 10 ounces in total. It uses a distinct white and pale green exterior which is somewhat typical for the Apera brand. Notably, the hard plastic build includes an IP67 waterproof and dustproof protection. It’s this extra layer of security between each section of the device which makes it perfectly suitable for taking out into the field, and for exposure to the elements. At the top of the instrument you’ll find the optical DO port for attaching a testing probe. That’s essentially the standard configuration for these type of instruments. But it’s worth noting how extra-secure the screw-type connection keeps your testing probe during measurement. The included 10-foot probe provides substantial distance and depth options for your testing. The AI480’s large, backlit LED is highly readable from at least three feet away. Measurement results are given in extra-large numerals, but some additional information is presented in a slightly smaller font. On the face of the device, you’ll notice the center row of buttons is rather intuitive. Up and down arrow keys are used to navigate the AI480’s interface. The top row of buttons is clearly labeled, allowing you to toggle the power, calibrate, and select between various modes. And the lower row allows you to enter setup and confirm your selections. This interface can take a few tries to get used to, but the important part is you never get lost along the way. From within the interface, you’ll find calibration can be done within about two minutes, and regular calibration isn’t necessary due to the optical design of the instrument. However, the AI480 does ensure that minimal maintenance is easy to do. 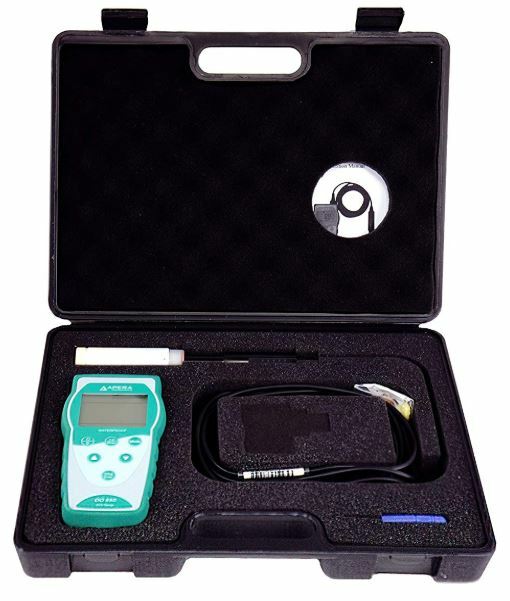 The AI480 includes a testing kit, the meter, a 10ft optical probe, and a calibration cap. All those goodies come packaged in a hard-shell carrying case. The case is a lined with protective foam, but is a tad oversized if you plan on using it for traveling. But if space isn’t of critical concern, the slightly oversized case is excellent for carrying lengthy probes and other equipment you might want to stick inside. It offers a measuring range of 0 to 20mg/L, with a resolution that reads to 0.0. And supported by a rather high accuracy of +/- 2%, the AI480 is suitable for aquaculture, water treatment, brewing beers, and basically any other aquatic consumer hobby. Unfortunately, the AI480 doesn’t offer data storage, or data output to another PC. It does offer automatic temperature compensation, with an operation range of 0-50°C operation. When powered by three AA batteries, the AI480 offers more than 200 hours of operation. The YSI Pro Series Galvanic Dissolved Oxygen Sensor is, you guessed it, a galvanic sensor. This sensor is for Pro20, Pro20i, Pro1020, and Pro2030, and Pro Plus instruments from YSI. If you’re using one of the YSI Pro Series instruments, sooner or later you’re going to need a replacement sensor. And given the lifespan of galvanic sensors, you may need some sooner than you thought. These YSI Pro Series sensors weigh 5.6 ounces, just like the sensors which they replace. They can be used alongside DO, conductivity tests, ISE, and ISE cables. The YSI Pro series sensor was built specifically to be simple to replace, so a user without any special technical knowledge, ability, or tools can make the swap. In fact, there are no tools necessary to operate or maintain the YSI Pro Series DO sensor at all. Included within its design, the Pro Series Galvanic Oxygen Sensor uses screw-on cap membranes, which are highly convenient for rapid replacement. You can change the membranes as simply as swapping a key, and that makes replacing smaller portions of the sensor possible, which quickly becomes far more economical than a full replacement. 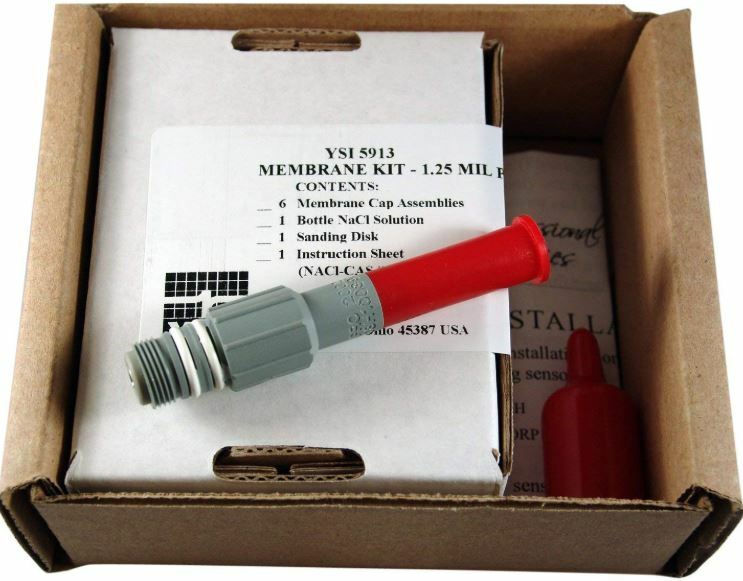 The YSI Pro Series sensor kit includes six membrane caps, and 1.25ml bottle of solution. The included membranes are built from a high quality polyethylene, and the sensor includes a six-month warranty. If you’re not already the owner of a YSI Pro Series instrument, they’re made to a wide variety of specifications. From the $500 range, up towards $1500 laboratory quality instruments, the Pro Series has it all. The MW600 is an economy-oriented portable DO meter. Anyone familiar with the brand will be able to immediately identify it as looking like a traditional Milwaukee instrument. This aesthetic makes the MW600 feel almost like a medical instrument. But in practical operation, the MW600 is oriented towards aquaculture, water analysis, educational, and environmental analysis. The MW600 weighs only 8 ounces, including the battery. Its physical build rests at 1.6 x 5.7 x 3.1-inches, composed of a hard shell plastic. While staying rugged, the plastic manages to stay smooth to the touch, and easy to wipe down. In the center of the MW600, it’s hard to miss the bright LCD screen. That display provides an easily readable standard mg/L readout. Your data readout is available in both ppm-grams or mg/L, and you get accuracy reading to a resolution of 0.1 mg/L. Operation is quite easy. The on/off button doesn’t need to be explained. The single calibration button unlocks the manual calibration, as well as two LEDs to indicate the status of calibration. At the top of the meter you’ll find a port for a probe, where you can attach the included polarographic probe and its 3M cable completed with screw-on cap membrane. Within those settings, you’ll find the two-point manual calibration. 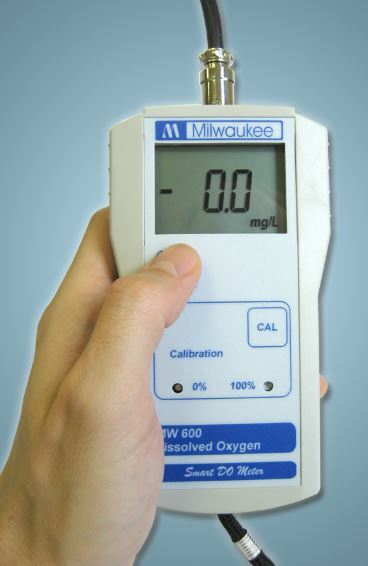 Although this requires a little experience and knowledge to do correctly, once you’ve got it down, you’ll have no problem quickly getting an accurate calibration out of the way. The automatic temperature compensation feature can cover your testing from 0 to 30°C. It offers the full standard testing range of 0 to 19.9 mg/L, and accuracy within +/- 1.5%. The MW600 operates with one 9V battery, which comes included with the instrument. It also includes the probe and testing cable (model number MA840), a calibration screwdriver, two extra membranes, a 20mL bottle of electrolyte solution, and an instructional booklet. The YSI Pro Series Galvanic Dissolved Oxygen Sensor is a replacement galvanic sensor for one the YSI instruments. YSI has a variety of instruments ranging from the relatively inexpensive $500 equipment, to laboratory grade gear. No matter which of the Pro Series instruments you’re using the YSI Pro Series DO sensor can offer all the same accuracy your current gear can provide. You can tell what the Milwaukee MW600 is just by looking at it. Even visually, it’s an excellent standardized professional instrument. Its ubiquitous testing design makes it equally adaptable to on-site testing, clinical practice, and educational settings. If you’re not dealing with truly toxic substances, and you don’t need data at a resolution of greater than one tenth mg/L, then picking up the MW600 is an easy choice to make.